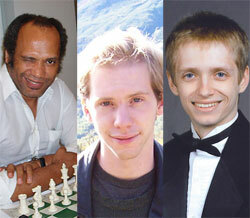 The United States Chess Federation - Five New FIDE Titles for the U.S.
Five New FIDE Titles for the U.S.
At the first FIDE congress of the year (January 27-28, Antalya, Turkey) Bryan Smith, Emory Tate and Salvijus Bercys received their International Master titles. Frank Berry and Jon Haskel earned International Organizer titles. Frank Berry is the organizer of the Oklahoma North American FIDE Open (Feb.17-19), which has a unique and controversial women's prize fund. Emory Tate games from the 2006 World Open are unavailable right now (Send them to me if you have them! ), but how could anyone get enough of the following classic Tate victory? Congratulations to all our title winners! According to Jesse Kraai and Greg Shahade, this may be the beginning of something big.